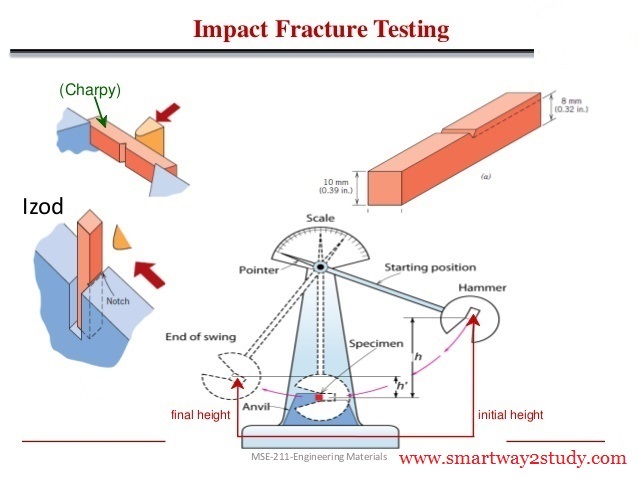 This test is more common than Izod test and it uses simply supported test piece of 10 mm X 10 mm section. The specimen is placed on supports or anvil so that the blow of striker is opposite to the notch. R = Distance from C.G of pendulum/striker to axis of rotation O. Shape of the notch. As the sharpness of the notch increases the energy required to rupture the specimen deceases. Dimensions of the specimen. By decreasing the dimensions of the specimen the energy of rupture decreases. 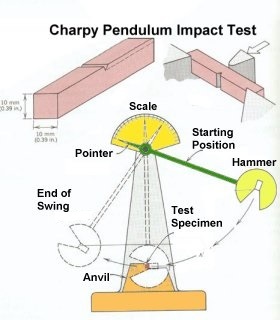 Velocity of Impact. The important resistance decreases above certain critical velocity, this varies from metal to metal. Specimen Temperature. 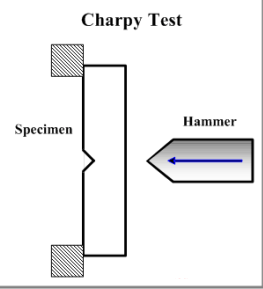 The temperature of specimen for a particular metal, determines whether the failure will be brittle, ductile or mixed character.